Oolong tea is a semi-fermented tea, combining the best qualities of green tea and black tea. Oolong tea is not only as clear and fragrant as green tea, but also as refreshing and strong as black tea.If you drink Oolong tea, the natural aroma may linger in your mouth and make your throat much comfortable. The processing of Chinese Oolong tea include six procedures: sunshine withering, tedding fresh leaves, rocking green, stir-fry gree, rolling, drying. According to different producing areas, Chinese Oolong tea is sorted by four types: North Fujian Oolong tea, South Fujian Oolong tea, Guangdong Oolong tea and Formosa Oolong tea. It's hard to confirm the specific time when Oolong tea was created. All historical records indicate that Fujian is the origin location of Oolong tea. The name of "Oolong" is also a enigma to Chinese tea history. Is it named after a placename or any variety of tea plant? The pinyin for "Oolong" is "Wu Long", which means "black dragon". 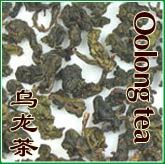 Does the tea name of "Oolong" have any relation with "Dragon" which traditionally taken as the Chinese lucky indication? Packing:In plywood chests lined with aluminium foil,paper cartons lined with plastic bag or aluminium foil bag,each chest or carton weighs 18-22kg net. Grading for oolongs changes from Fanciest or Extra Fancy (best) to Common (worst). Unlike other grading systems, this one actually rates the quality of the drink you can get from the leaves. The top grades are Fanciest or Extra Fancy, Fancy, and Extra Choice (or Extra Fine).